Like many places in Point Reyes National Seashore, the drive to the Tomales Point trailhead takes longer than might be expected; the 16 miles from the Bear Valley visitor center is mostly along narrow, bumpy, bendy and sometimes steep roads, initially north along the shore of Tomales Bay, up and down the wooded slopes of Inverness Ridge then across the wide open grassland that occupies the northwestern section of the peninsula. The road ends after a journey of about 45 minutes at Pierce Point Ranch, beyond which, to the north, the land extends another 4 miles, narrowing gradually. 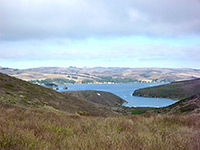 This isolated, hilly peninsula is Tomales Point, a grassy, treeless, often windswept and foggy place, traversed by a 4.7 mile trail which ends at the very tip of the promontory, about 40 feet above the water - like most of the coastline hereabouts, the point is edged by sheer cliffs and there are no recognized routes down to the ocean. 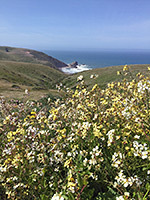 Many people drive to this section of the national seashore, some to visit the adjacent ranch, which contains a selection of historic buildings and farming equipment, and some to walk the much shorter path to nearby McClures Beach, but the Tomales Point Trail is the main attraction, even though only about five percent of hikers continue all the way to the northern end. The final 1.5 miles are officially unmaintained, overgrown and sandy, so some turn around here, while several minor summits before this provide other targets for shorter trips. Although the foreground is largely unchanging on the whole trail, and the surroundings have little of interest beyond a few rocky outcrops and a fair selection of wildflowers, the hike as a whole is quite spectacular, especially on clear days, offering fantastic, elevated views over the Pacific Ocean to the west, and Tomales Bay and the mainland to the east - like walking across a high island, and there are very few other hikes in the state which offer a similar experience. Point Reyes National Seashore map, Tomales Point topographic map. 19 views along the Tomales Point Trail. The trailhead at Tomales Point is reached by Pierce Point Road, forking north off Sir Francis Drake Boulevard near the high point of Inverness Ridge, descending into pastoral land on the west side of the peninsula, and passing through five historic (though still active) cattle ranches, designated M, H, I, K and J, before ending beside the white-painted, weather-worn buildings from a sixth - Pierce Point Ranch. Established in 1858, this was a particularly successful operation, and continued all the way until 1973. The adjoining residence seems still to be inhabited, but the farm buildings are long disused though well preserved and open to inspection, most from the inside as well as out. 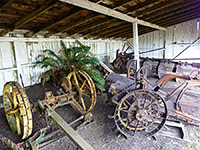 Structures include a large milking shed, a school, and a barn containing a selection of iron equipment. A typical fine summer's day may see a hundred or more vehicles parked by the ranch, with most people here for the Tomales Point Trail, and others for the 0.4 mile path to McClures Beach. The trailhead has a working payphone, somewhat unusually, but no other facilities. Big, green cypress and eucalyptus guard the perimeter of the ranch, but there are virtually no trees anywhere else on this northern end of Point Reyes, just grass and low, wind-beaten bushes. The wide trail rounds the edge of the ranch, bearing west towards the ocean, and rising gradually across the side of a small hill, the crest of which reveals a sizeable depression ahead, known as Windy Gap. To the west, a deep, narrow ravine winds towards the coast, its sides nicely sculpted into thin, parallel ridges. The ravine meets the coast at Driftwood Beach, which like McClures Beach to the south is lined by orange and brown rocks, though unlike McClures there does not seem to be an easy way down. The path descends a little to a saddle, giving views east towards the inlet of White Gulch, then is soon rising again, up a long slope where as many as four parallel tracks have been worn in the firm granitic soil. Another minor summit (539 feet - the highest point of the hike) is passed, after which the gradient is mostly down, yet the peninsula still extends along way to the north. Yellow tree lupine is the most widespread flowering plant, while yellow is also the dominant color elsewhere; other examples include California poppy, woolly sunflower, capeweed, everlasting pea, hairy gumplant, and various dandelion-like species. 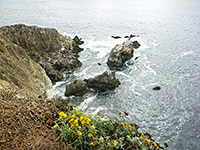 The trail crests the brow of a little ridge, near some whitish rock outcrops, moves eastwards a short distance and descends past a small pond lined by clumps of the bright pink belladonna lily, a non-native plant, common all along the northern California coast. 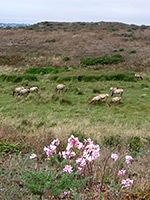 Elk are often sighted by the pond; all of the north part of the peninsula is part of Tule Elk Reserve, occupying the land once used by Pierce Point Ranch. 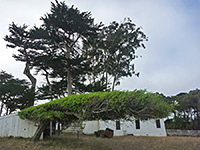 Just beyond is another group of cypress trees, the only sign of Lower Pierce Ranch, buildings from which were removed many years ago. A tiny stream flows across the path nearby, descending eastwards into Tomales Bay. The ranchsite is another location where some people turn back, avoiding the sandier last 1.5 miles of the trail; this continues up the next low hill, now through somewhat bushier surroundings, and on to the final summit (235 feet). The remaining stretch is all down, over quite soft earth, to a worn sandstone outcrop about 40 feet above the water. 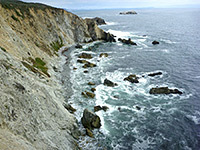 The tip of the peninsula is known as Tomales Bluff. A few detached rocks sit just offshore to the north and east, buffeted by fierce waves. A pretty, very narrow pebble beach extends along the foot of a high, unstable cliff just to the west, but there is no route down. The coastline on the bay-side of the peninsula is more gentle though also inaccessible. The views are of course very extensive - north to the narrow spit of Doran Beach near Bodega Head, inland over the undulating hills of Bolinas Ridge, and a long way out across the Pacific. The last section of the path also overlooks the whitish dome of Bird Rock to the west, home to a big population of seabirds. In general though, the other beaches and cliffs along the peninsula are completely out of sight, hidden by the gently sloping land either side of the ridgeline. There are no spur paths, though other parts of the peninsula can be easily explored by walking cross country.